Second Scoop Frozen News: 3 more flavors from Mars! 3 more flavors from Mars! 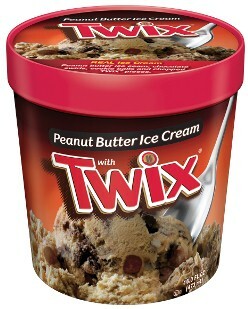 2010 saws the introduction of M&M chocolate ice cream, Snickers vanilla ice cream and Twix caramel ice cream (image) from Mars. It apparently went well because there are 3 more flavors coming!! 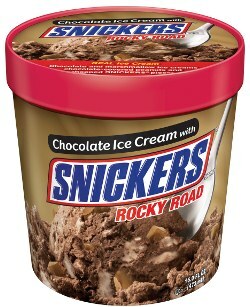 I nearly wet myself when I saw the words "Snickers" and "Rocky Road" next to each other. and chopped SNICKERS Bar pieces. and chopped pieces of TWIX Cookie Bars. Chocolate malt ice cream, smooth caramel and chocolate chunks. Building on the success of Mars Ice Cream pints introduced in early 2010, the company is adding three more flavors to the portfolio, bringing the total to six choices. The new Candy Pints have everything you expect from Mars Ice Cream: real ice cream quality, great taste and iconic brands — all at a good value. 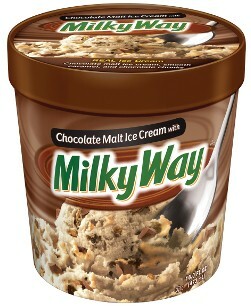 The delicious new flavors are ideal for consumers who desire 16 ounces of real ice cream, not a frozen dairy dessert. I think that you guys should make a peanut butter snickers rocky road that would make it perfect. I love chocolate ice cream, so adding snickers made this absolutely amazing!